The eagle relief has been discovered 3 km west of the Roman city, Assoc. Prof. Pavlina Vladkova from the Veliko Tarnovo Regional Musuem of History, who is one of the lead archaeologists of the 2015 summer excavations of Novae, has told local news site Svishtov Today. The Ancient Roman eagle relief is part of a large limestone block which has been damaged by human activity and by having been submerged in the waters of the Danube River for an unknown period of time. The face of the limestone block shows a relief of an eagle with closed wings; unfortunately, the head of the eagle, which was turned to the right, is missing. One of the narrow sides of the limestone block has a square pit indicating that the entire block was built into a wall. The feathers, torso, and legs of the eagle are envgraved with both shallow and deep marks of various size and directions which make the bird’s figure more expressive using the light and shadow effects. 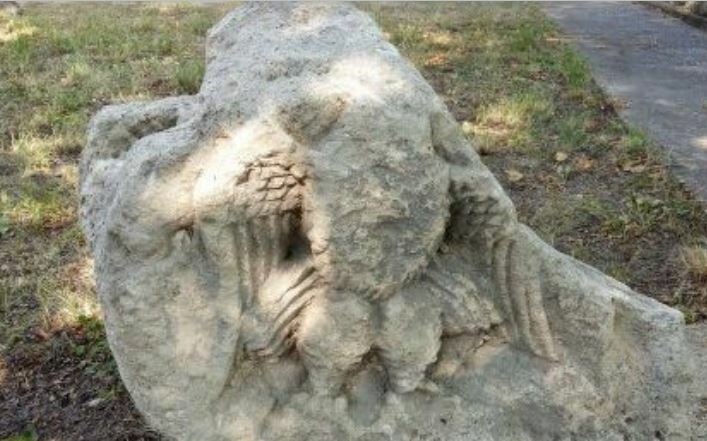 The archaeologists excavating the Roman city in Bulgaria’s Svishtov think that the newly found eagle relief was part of a richly decorated facade of a public building, probably a temple, and point out that this is the first time a monument of this kind has been found in Novae. They note that the eagle symbolized the supreme Roman god Jupiter, and that in Novae which was started as the military camp of the First Italian Legion (Legio I Italica), this cult was very popular and was formally celebrated in Novae’s principia (military headquarters). There the archaeologists excavating the Ancient Roman city have discovered over the years several inscriptions with dedications to Jupiter, and marble and bronze statues of eagles. Jupiter was the main Roman deity that the Roman civil servants addressed with their prayers for the Emperor; the deity was worshipped by both the military veterans and the civilian population which lived outside of the military camp of Novae. The newly discovered eagle relief is seen as further evidence that Novae also had a temple dedicated to the Roman god Jupiter Optimus Maximus, which was located outside the fortress walls, and that its facade was richly decorated. Other evidence for that are the discoveries over the years of several inscriptions dedicated to Jupiter on the bank of the Danube near the Roman military camp. The newly found eagle relief is the second exciting archaeological artifact found in Novae since the start of the 2015 summer excavations. Last week, the archaeologists excavating the Ancient Roman city of Novae near the Bulgarian Danube town of Svishtov have discovered a pedestal with an inscription in Latin which is dedicated to ancient deities Apollo and Diana. The discovery of the Roman inscription came at the start of the 56th annual summer digs at Novae conducted by archaeologists from Bulgaria and Poland. The Roman Military Camp and Late Antiquity City of Novae is located 4 km east of the Bulgarian Danube city of Svishtov in an area called Staklen (meaning “made of glass” – because of the Ancient Roman glass fragments on the site). It was a legionary base and a Late Roman city which formed around its canabae, a civilian settlement near a Roman military camp, housing dependents, in the Roman province Moesia Inferior, later Moesia II, set up after the Roman Empire conquered Ancient Thrace south of the Danube in 46 AD. It had a total area of 44 hectares (108 acres), according to a decree of Roman Emperor Vespasian (r. 69-79 AD).